Erst frisch gemahlen beschenken uns Gewürze mit ihrem vollen Aroma, da sich beim Mahlen ihre ätherischen Öle freisetzen. So hat WMF die Ceramill Gewürzmühlen nach dem Vorbild von Pfeffermühlen entwickelt und sie ebenfalls mit einem langlebigen Keramikmahlwerk ausgestattet. Die Mahlstärke lässt sich über ein Einstellrad stufenlos einstellen, um je nach Gewürz die gewünschte Körnung zu erhalten. Gewürzmühlen haben einen Behälter aus Glas, so erkennen Sie auf einen Blick, wie viel Vorrat Sie noch haben. Er ist leicht zu befüllen und in der Spülmaschine zu reinigen. Das Oberteil gibt es wahlweise aus Cromargan® Edelstahl Rostfrei 18/10, Eichenholz oder hochwertigem Kunststoff. Bei allen Gewürzmühlen sitzt das Mahlwerk oben und hinterlässt keine Mahlspuren auf dem Tisch. Zusätzlich schützt ein Aromadeckel den Mahlkopf und bewahrt gleichzeitig das Gewürzaroma. No kitchen is complete without spices. To ensure that you don't create just any old flavour but the best and most aromatic, WMF offers you a whole range of functional spice mills. When the essential oils are released from the spices during the grinding process, there are no limits to the ways in which you can improve the flavour of your food. Enjoy flavours that are far superior compared with those of industrially-produced, powdered spices. Use the WMF spice mills to grind your spices effortlessly in your own kitchen – they combine functionality with aesthetics and so are hard to resist. All WMF spice mills are equipped with the exclusive Ceramill® ceramic grinding mechanism, which is completely resistant to abrasion and corrosion. This makes them a useful companion for freshly ground spices at the table or in your cooking for years to come. The ceramic grinding mechanism is harder than steel, and can be infinitely adjusted from a very fine to a coarse grind by means of an adjusting wheel. In addition, every WMF mill comes with an aroma lid, which sits firmly on the spice mill, thereby protecting the grinding mechanism and retaining the aroma of the spices. This means that the WMF spice mills are also suitable for storing your herbs and spices. You can use the spice mills for any herbs and spices – besides kitchen herbs and exotic spices, they are also ideal for salt and pepper. Place them on the table to let your guests add extra seasoning to their own food or be impressed by the performance of the spice mills in the kitchen – either way, the different models are real eye-catchers. To avoid getting mixed up by all the different spices in your kitchen, you can buy WMF spice mills that have the names of the spices on them. Whether you need a spice mill for sea salt or coloured pepper, you are bound to find the right one here. Each spice mill consists of a glass container, which holds the spices, and a grinding mechanism, which is covered with Cromargan® stainless steel, synthetic material or wood. You can choose a suitable design variant from the various collections to match your kitchen, such as Classic, De Luxe, Trend or Batido.  Browse through the WMF range now – you will be impressed by the quality of the spice mills!